For the Canadian author, see Bill Freeman. Bill Freeman is a professional racing driver, race team owner, motorsport racing enthusiast, race car manufacturer, and business entrepreneur. 1977 S.C.C.A. B-Production National Champion (SP Division - Porsche 911RSR) Freeman was S.C.C.A. National Champion in his 911 Porsche. 1979 - 1980 Freeman was the originator and supervisor for all aspects of a new Ferrari IMSA team. Paul Newman and Bill Freeman at Willow Springs Raceway in 1976 alongside Bill Freeman's Porsche 911. In 1978 Paul Newman and Bill Freeman formed a racing partnership to compete in various forms of auto racing. The Racing Team was based in Santa Barbara, California. As the team's Managing Partner, Freeman managed all aspects and operations for this professional automobile racing company. The company specialized in Indy Cars, Can-Am, and other high-performance motorsport racing. The team raced in Chevrolet-powered Spyder NF's, sponsored by Budweiser. The "Newman Freeman Racing" team dominated North America's Can Am series in its Budweiser sponsored Lola team. The partnership attracted several drivers who would go on to become legends in the future, included Keke Rosberg, Elliott Forbes-Robinson, Bobby Rahal, Danny Sullivan, Teo Fabi, and others. Driving for Newman Freeman Racing, these drivers won many competitions including the Can-Am Team Championship of 1979. 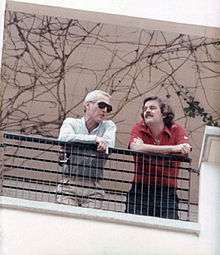 Paul Newman and Bill Freeman on Princess Grace's balcony overlooking the Monaco Grand Prix, 1979. Bill Freeman is credited as the man who introduced Paul Newman to professional auto racing. In addition to the team management, Bill Freeman and Paul Newman drove many S.C.C.A. and I.M.S.A. events together, including the Sebring 12 hour endurance sports car race. Freeman was General Manager and Team Manager for Gurney Freeman Racing Indianapolis 500 CART championship racing team and partners with Dan Gurney at All American Racers in Santa Ana, California. In 1979 Freeman also formed Fine Sports Cars with partner Ashton Marshall, to remanufacture, restore, and offer for sale legendary sports racing cars. The company was based in San Diego, California, with a showroom, The Fine Car Store, located in La Jolla, California. In 2009 the company was expanded. Freeman, Fine Sports Cars CEO, took on an additional partner Dr. Michael Prior. Prior restructured the company operations to encompass a full range of vintage sports racing cars including both sanctioned and certified cars, established a global network of workshops and suppliers, and established a regional office in Europe. ↑ Davis, Dan (July 2011). "SCCA Goes Pro!" (PDF). Victory Lane. Victory Lane Magazine Inc.: 40. ↑ "Paul Newman's Porsche - 1974 Porsche 911S - SCD Motors - The Sports, Racing and Vintage Car Market". Sportscardigest.com. 2014-03-04. Retrieved 2014-07-27. ↑ "All Results of Paul Newman". racingsportscars.com. Retrieved 2014-07-27. ↑ "Paul Newman (USA)'s cars - Photo Gallery". Racing Sports Cars. Retrieved 2014-07-27. ↑ "World Sports Racing Prototypes - Can-Am 1977". Archive.today. Retrieved 2014-07-27. ↑ "1990 Ferrari 308 GTB/Huffaker IMSA GTU Racing Car | Sports & Classics of Monterey 2008". Rm Auctions. Retrieved 2014-07-27. 1 2 "Russo and Steele". Russo and Steele. Archived from the original on 2012-10-24. Retrieved 2014-07-27. ↑ Stone, M. (2009). Winning - The Racing Life of Paul Newman. pp. 112–116. ISBN 978-0-7603-3706-6. ↑ "Newman a lot of things, but for many years, racing came first - Racing - ESPN". Sports.espn.go.com. 2008-09-28. Retrieved 2014-07-27. ↑ "1974 Porsche 911S | Mecum Auctions". Mecum.com. Retrieved 2014-07-27. ↑ "1981 Indianapolis 500". Racing-Reference.info. 1982-05-29. Retrieved 2014-07-27. 1 2 "Race Results for the 1982 Indianapolis 500". indianapolismotorspeedway.com. Archived from the original on 2014-07-14. Retrieved 2014-07-27. 1 2 "Directors Bill Freeman, Ashton Marshall, Dr. Michael Prior and Les Pioch". Fine Sports Cars. Retrieved 2014-07-27. ↑ "Road & Track 200006". 330gt.com. Retrieved 2014-07-27. ↑ Reynolds, K. (June 2000). "Respectable Replicas". Road and Track. Hearst Magazines. ↑ Ford Heacock (March–April 2014). "Shelby Family orders recreation of Aston Martin DBR1". Vintage Motorsport Magazine. Southeast Racing Assn: 10. ↑ "Newman Freeman Racing". Car-from-uk.com. 2014-05-25. Retrieved 2014-07-27. ↑ Alexis Gousseau (1989-10-26). "IMSA History". IMSA History. Retrieved 2014-07-27.